From the New York Times–bestselling author of Science in the Soul. "If any recent writing about science is poetic, it is this" (The Wall Street Journal). Did Newton "unweave the rainbow" by reducing it to its prismatic colors, as Keats contended? Did he, in other words, diminish beauty? Far from it, says acclaimed scientist Richard Dawkins; Newton's unweaving is the key too much of modern astronomy and to the breathtaking poetry of modern cosmology. Mysteries don't lose their poetry because they are solved: the solution often is more beautiful than the puzzle, uncovering deeper mysteries. 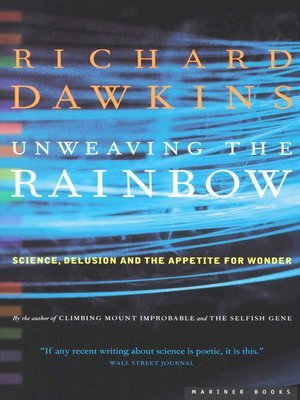 With the wit, insight, and spellbinding prose that have made him a bestselling author, Dawkins takes up the most important and compelling topics in modern science, from astronomy and genetics to language and virtual reality, combining them in a landmark statement of the human appetite for wonder. This is the book Richard Dawkins was meant to write: a brilliant assessment of what science is (and isn't), a tribute to science not because it is useful but because it is uplifting.